Gaining muscle mass and definition throughout the entire biceps muscle can help increase size in the lower biceps area. Perform three sets of each biceps exercise for eight repetitions to promote muscle hypertrophy and gain strength in the upper arm. Stick with free weights to pump up your arms and rest at least seven days between biceps workouts to give yourself adequate time to recover. Before starting any resistance training program, be sure to consult a physician. The biceps consists of an inner, or short head region and outer, or long head region. The muscle is responsible for moving your hands up toward your shoulders or rotating your palm upward. You can stimulate muscle growth by placing stress on the biceps brachii and brachialis muscles with weight training. The dumbbell preacher curl can help add muscle mass to the flexors and lower biceps region while shaping the entire upper arm. Grasp a dumbbell with an underhand grip and stand with the backside of your lower and upper arm resting on the support pad of an incline bench. Stiffen your core and abdominal muscles to help stabilize your spine and support your body by assuming a split-stance position. Gradually raise the dumbbell from the support pad while exhaling and move the weight toward you while bending the elbow. Keep your wrist in a neutral position and avoid shifting your body during the movement. Continue to lift the weight until your elbow is fully flexed then slowly lower the dumbbell back to the starting position on the support pad. 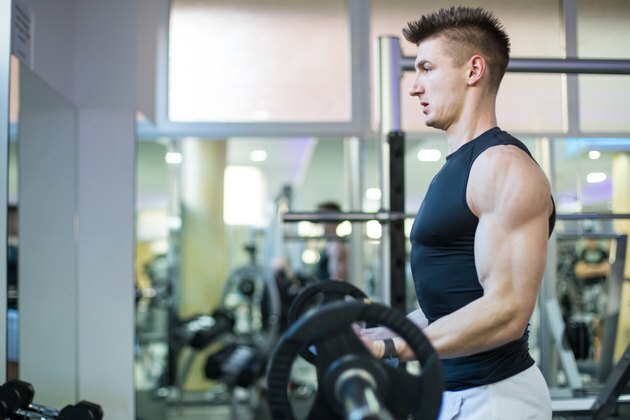 Barbell curls help to pack mass onto both the lower and upper biceps area. Stand with your back straight, holding an EZ curl or barbell with a shoulder-width grip. Slowly curl the weight to your chest area in a controlled manner, avoiding any swinging or jerking motion, which could cause injury. Flex the biceps as you lift the weight and keep your elbows fixed at your sides to maintain strict form. As the weight nears your chest, lower the bar slowly. When your arms are fully extended, repeat the movement. Hammer curls target the brachialis muscle and add mass to the overall biceps area. The exercise helps to accentuate the peak of your biceps when flexing. Hold a set of dumbbells while standing erect with your arms at your sides and palms facing one another. Curl the weights until the dumbbells reach your shoulder area, and then gradually lower the weights until your arms are fully extended. Repeat the movement. Keep your elbows fixed at your sides to ensure the stress remains on your lower biceps. What Is Happening During a Bicep Curl?